PENNYLANE PATCHWORK: Trips around the World with a difference! Trips around the World with a difference! As is usual for me, I have changed my Trips Around the World to be a little different to the ones that are being sewn up all over the world at the moment thanks to the craze Bonnie Hunter started. My first 'Trip' is made in the 'scrappy' way but I have used 8 fabrics in each square instead of six. I used fabrics that are modern and colourful and look great together. In my second 'Trip' I used 6 fabrics but cut the strips 2" wide instead of 2 1/2", giving me a pretty little cot quilt in pastel pinks. 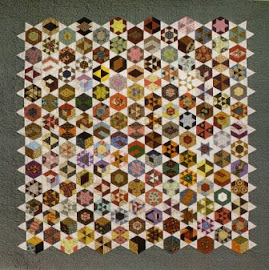 My good friend Wendy found a version of the scrappy trip around the world in an old book and has made a rich coloured quilt in Reproduction fabrics, watch her blog 'Legend and Lace' for a picture of the finished top. Both quilts are beautiful, Penny. This pattern has a lot of movement. It's more subtle with the pastel pinks. Fun to see you two playing in fabrics/colorways. Those are both so gorgeous! It's amazing how different the same pattern can look with different color choices.